Try James’ gently spicy, sticky ribs for the authentic taste of the deep-south. You could finish the ribs off on a barbecue instead of the oven if you prefer. Place the ribs in a large, wide saucepan. Cover with water and add the onion, garlic, fennel seeds and star anise. Bring to a boil, then reduce the heat and simmer very gently for three hours, or until the meat is tender, skimming any scum off occasionally. Rub the baking potatoes with a little oil. Create four small piles of sea salt in a baking tray then place the potatoes on top. Bake for 1-1½ hours, or until tender. Meanwhile, make the bbq sauce. Heat a sauté pan until hot and add the butter, onions and garlic and fry for 4-5 minutes, or until softened. Add the chillies, fennel seeds, star anise and sugar. Cook for a further 3-4 minutes until the sugar has dissolved. Add the ketchups and soy sauce and bring to the boil. Reduce the heat and simmer for five minutes, or until thickened. Remove from the heat and cool slightly before placing in a blender. Pulse to form a smooth pureé. 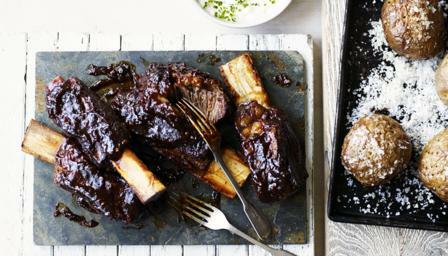 Dip the ribs into the sauce then place into a roasting tray and spoon some more sauce over the top. Place in the oven with the potatoes for 15-20 minutes until sticky. While the ribs cook, put the double cream, lemon juice, chives and a pinch of salt into a large bowl and whisk until thickened. Serve the ribs with the jacket potato topped with a dollop of butter and soured cream.